One of my kids’ favorite meals is the “yellow chicken on a stick”, which most people know to be Thai Chicken Satay. And I can’t blame them for liking it. 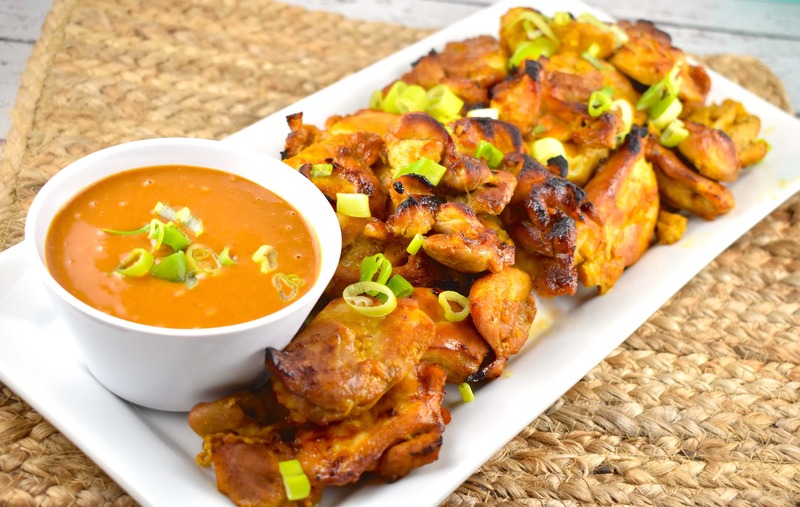 It’s got tender, juicy chicken that’s marinated in a truly divine peanut sauce and then it’s grilled to perfection and served with extra sauce for dipping. What’s not to love? However, the easiest way to get Thai Chicken Satay is to go out to eat. However, as great as it is to not have to cook or do the dishes, going out to eat has two major downsides – it gets expensive and it leads to eating other delicious, but usually high calorie foods that I don’t need (Mango Sticky Rice, anyone?). So, I like to try and make my family’s favorite meals at home and to give them a lighter, healthier twist. I started marinating the chicken and that went great – until I realized that I didn’t have any skewers to cook the chicken on. I had two options – load the kids up in the car (they were playing peacefully and quietly at the time) and go to the store to get some, or leave the kids be and make it without the skewers. If you’ve got kids, you know it didn’t take long for the second option to be the winner. And, my Lazy Satay Chicken was born. Wow, let me tell you, it’s fabulous. I LOVED not having to deal with skewers. This was so much easier! I’ll admit, though, to keep peace in the house, I gave my kids toothpicks when I served it. They thought spearing the chicken pieces and dipping them in sauce was just great. The only downside of this recipe for me is that it’s still pretty high in points. The only way I can really fit it in to the day’s point budget is to serve it with several sides of veggies and skip the rice (especially the Mango Sticky Rice). However, that works just fine, and I can fix some rice for the kids if they want it. Not only that, it’s STILL lighter and healthier than the version you get when going out to eat (not to mention less expensive!). If you want to make it a little lighter in points, you can use powdered peanut butter (just reconstitute it according to the directions) and chicken breast instead of chicken thighs. I personally like the flavor of the darker chicken thigh meat. It seems to be juicer. Don’t skimp on the curry powder either – it’s what gives this dish its distinctive yellow color and adds that delicious zest to the flavor. Don’t short change the marinating time, either. It’s important for the chicken to have time to soak up those juices. If you plan ahead, it’s just as easy to whip up the marinate the night before and let it sit in the fridge overnight. You’ll end up with a seriously delicious satay. I fell in love with this Lazy Satay Chicken. The tender and juicy chicken, the rich flavor of the sauce and the ease of not have to worry about skewers and just broiling the chicken for a few minutes. I loved everything about it – especially that it is lighter, healthier and less expensive than going out to eat – but just as delicious! Get all the delicious flavors of Thai chicken satay with a lot less work and ingredients. Complete with a rich and velvety peanut sauce for dipping! In a large bowl, combine all ingredients for the chicken to make the marinade. Add in the chicken pieces, and toss to coat. Cover and refrigerate for 2 hours or overnight. Preheat oven to broil, and line a rimmed baking sheet with foil or parchment paper. Mist with cooking spray. Place the pieces of chicken onto the baking sheet, spreading out evenly. Discard any remaining marinade. Broil chicken in oven four about 8-10 minutes, or until chicken is golden and browned/blackened on the edges. While chicken is cooking, whisk together all ingredients for the satay sauce in a small bowl. Serve at room temperature with chicken for dipping. I select with my cursor the total contents within the “print recipe” frame (put cursor on the left top corner, hold the left mouse-button and drag the cursor to the right bottom corner of the frame) . Then I right-click the mouse and choose “print” in the options that pop up when you do that. It prints the recipe nicely. Frustrated in not being able to print your recipes. What is the best way to print your recipes? I notice that the “print” option has disappeared, but it hasn’t worked for quite some time anyway. Would you please let all of your subscribers know what is happening? I have already emailed you a number of times without any response. I agree – just tried to print and it came out all jumbled with advertisements printed over the top of the recipe. I really hope it can be fixed. I love your site.